Celtic Solstice – I would relaly like to get this done this month. I mean, finish the backing, prep the batting, and get this quilted. ==> I’m still not done with this project. Because this is so big I can only work on it during the weekend when I have the time to spread it out. I have the back done but I still need to prep the batting and quilt it. There was just too many things going on this month and didn’t have enough free weekends to finish this. 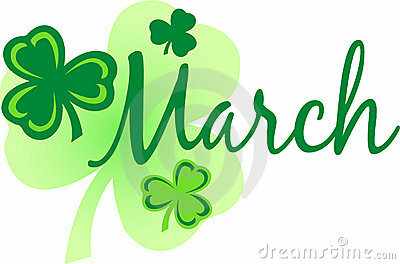 I hope hope hope that I’m able to find a weekend in April. It might have to be a Sunday in April as the kids and I went through and planned a bunch of activities over the next few Saturdays. 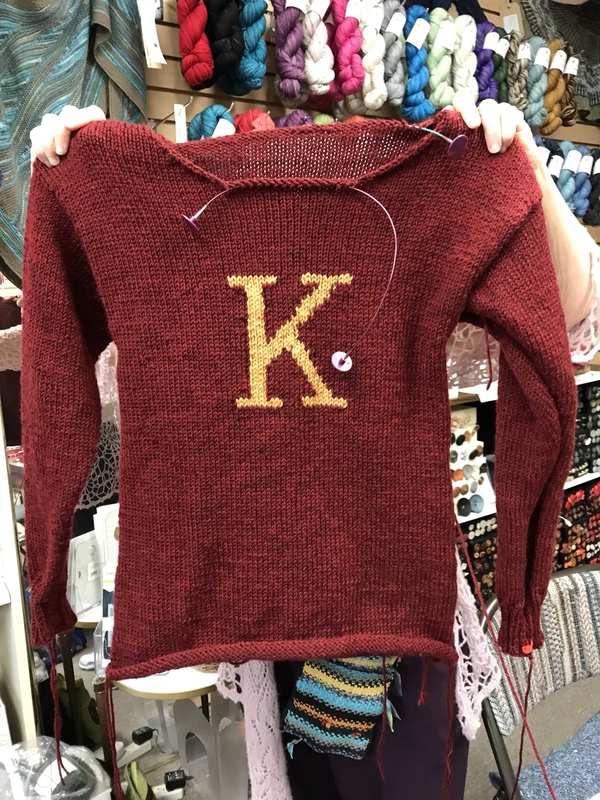 Kayla’s Weasley Sweater – Finish the sleeves. I’m not sure how much more I need to do but I can smell the finish. I need to have Kayla try this on and see how much longer I need to go on the sleeves. I hope that I can get this finished this month. Since I’m a newer sweater knitter I can’t tell whether that is doable or not. I did finish the sleeves and I’m almost done mattress stitching the sides. One that is done, the next step is to pick up and knit up the neck. I think this can be finished in April. On Thursday, I got the yarn for Jacob’s Weasley Sweater and I casted on for that. The March socks in Knitting Expat’s Sock Club. Land of Sweets Cowl – I need to take a picture of this for my next knitting update. 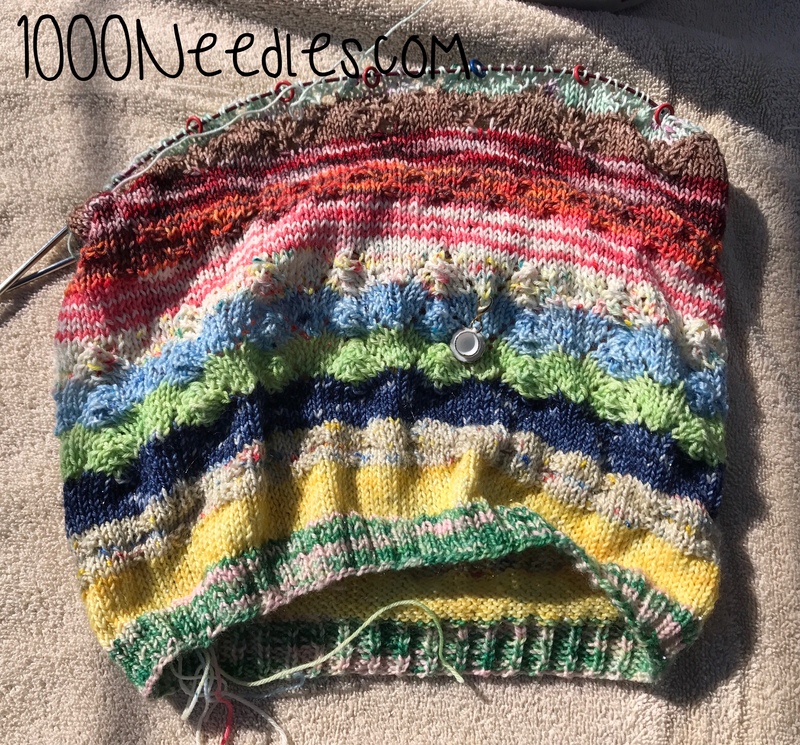 Now that the Martine Hat is finished I moved this project up to the third primary position. The plan is to work a round every day. I’m a little more than halfway done. I do not always get a round done every day but I am making progress. 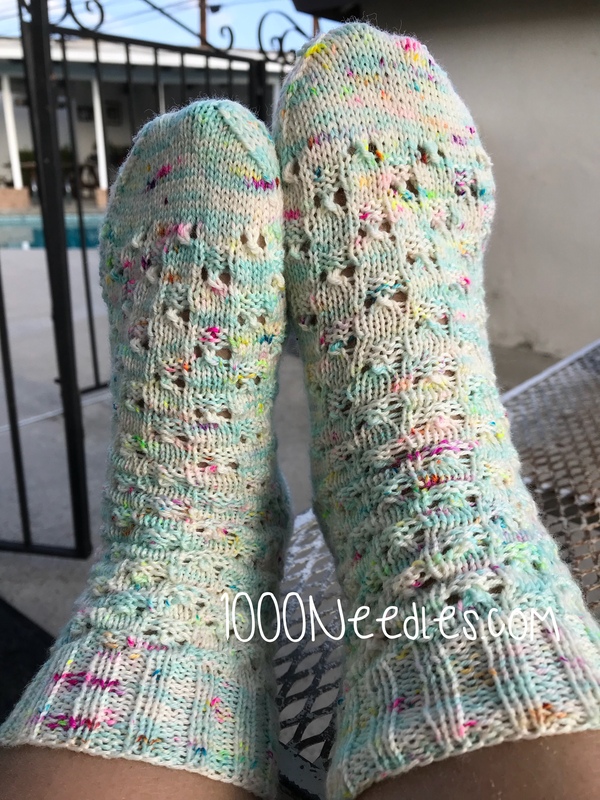 Mama’s Bukid – Finish row 10 (which I’m very close to finishing), row 11, and row 12. DONE! 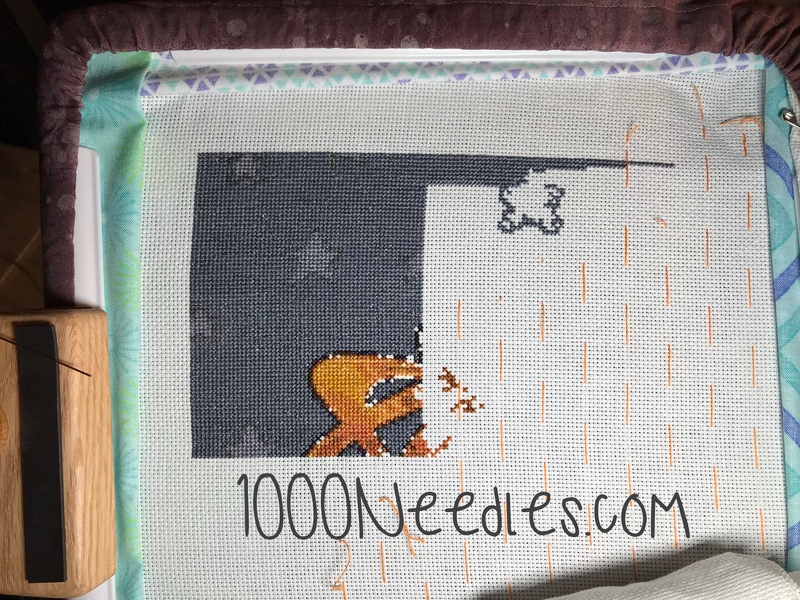 I’m actually working on row 13 so I’m progressing quickly on this project. Gamer Nouveau – Just keep doing what I’m doing. This is not a priority project so keep doing a bit every day as I feel like it and see where I am at the end of the month. I do want to get a scroll frame for this project. I outgrew the small plastic hook I had and I’m currently using a small QSnap. 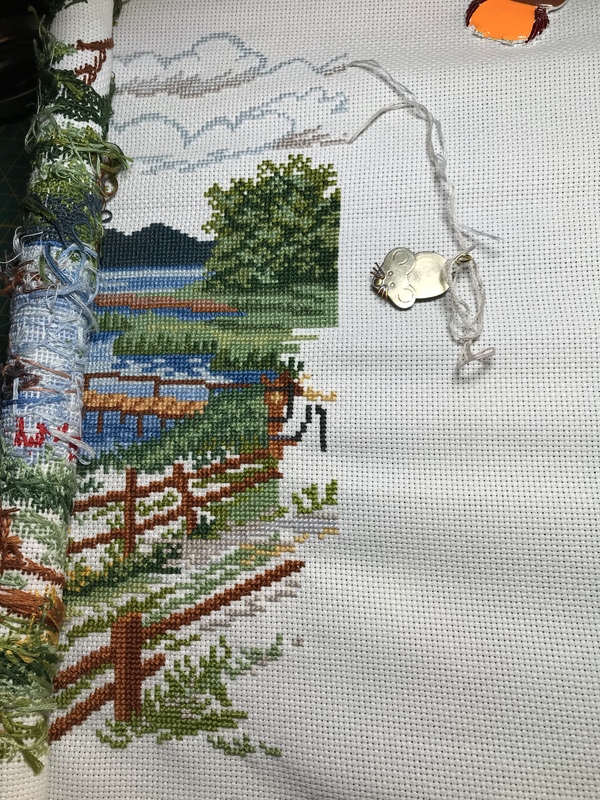 I have a larger QSnap that I will use but once this project outgrows the larger QSnap, I plan to get another scroll frame. I do want to save some money for this though as I don’t need it right now. At the beginning of March, I bought a scroll and table frame specifically for this project. But it never came. I bought it from ABCStitch.com and after 4 weeks of waiting to hear when it would be shipped (I communicated with them and they couldn’t tell me when they would get it and ship it out) I cancelled my order. I do not have a local needle shop (LNS) but found one about 30 minutes away. I guess to some that would be local but it’s pretty far from me distance wise and I would have to make sure I went when there was NO traffic because that 30 minutes in traffic would become an hour and a half. Anyway, I called the shop and made my way there and they are ordering me one. The ladies were really nice and they will call me next week to let me know the timeframe of when I can expect to have the items. Because of the holiday (Passover/Easter), their normal distributors were closed.